We want to take a moment to lift up a great opportunity for our local ally organizations. This Thursday, September 13th is Give For Good Louisville Day! ACLU of Kentucky – has a dedicated Reproductive Freedom Project, goes to the mat against Bevin n them every time. Kentucky Health Justice Network – runs a practical support Abortion Support Fund providing funding, transport, lodging, language interpretation, and childcare to folks facing barriers to abortion access. Also has a Trans Health Fund, and Birth Control Access program. Kentucky Religious Coalition for Reproductive Choice – does Repro Rights outreach and advocacy and offers faith based, all options pregnancy counseling. A Fund, Inc – provides funding assistance through abortion clinics for Kentucky residents. Kentucky Home Birth Coalition – working to expand birth options, and pass pro-family legislation that will allow CPMs to be licensed in KY, improving maternal health outcomes. Donations can be as little as $10, and can only be made between midnight and 11:59pm on 9/13/18. Follow #GiveForGoodLou to see if our faves WIN throughout the day! It seems everyone today has an opinion on reproductive health choices and access to legal abortion. Escorting at EMW Women’s Surgical Center, assisting clients get to their appointments with as little interference/harassment from anti-choice protesters as possible, my mind is constantly engaged and thinking. 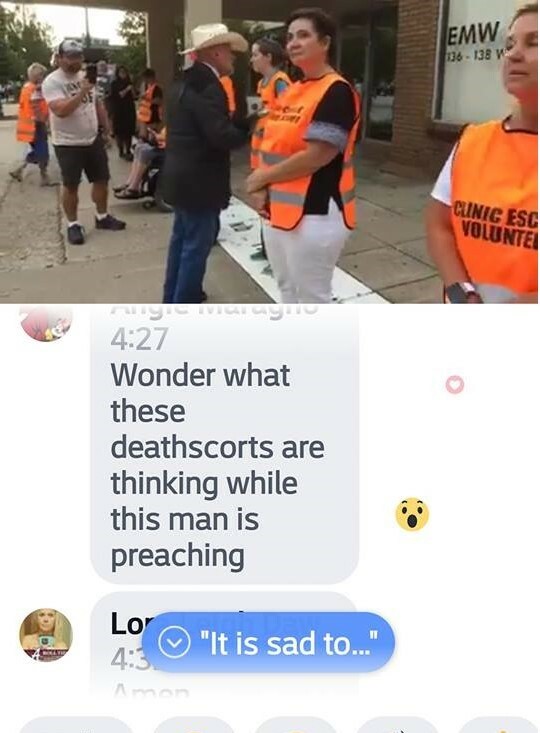 So when this screen capture taken off a video Operation Save America posted and I read that comment from a viewer, I pondered on it. What was I thinking as I calmly stood there that Friday morning, while Rusty Thomas of OSA (in town for a federal court appearance) bellowed, roared and shamed clients, companions, and escorts alike that morning? I thought back to May 13, 2017 when this man in front of me chose to break federal law and cross the property line, sitting down with about a dozen followers blocking the entry doors until eventually peacefully removed by LMPD after many polite requests and invitations by the officers went unanswered. I thought about the dynamics I was watching that Friday morning among the anti-abortion protesters. I watched when the cameras came on and when they had an audience, they kicked it into high gear, yelling shaming, preaching. I thought about theatrics they love to present: escorts as stone-hearted, cold, uncaring people and themselves as poor put-upon saviors. I thought about the perception their viewers must have when they watch these videos. I wonder if viewers know how much of a show it is to recruit donations and support? I thought about the distortions they offer, the narratives they speak when they claim a save. In reality sometimes clients or companions tell them just what they want to hear so they will be left alone. I thought about clients having to come back for a second appointment because they were tricked into the CPC next door and missed their originally scheduled one. I thought back to last July when we had a very temporary buffer zone and Federal Marshals on hand. How much safer clients felt when they did not have anti-abortion protesters in their face, blocking their path, leaning over and separating them from their companions. I thought about Rusty Thomas’ court appearance that Friday morning. I wondered if a federal judge would even think about weighing a First Amendment right to free speech versus the safety of citizens trying to just go to their doctor’s appointment? I thought about how difficult and how politically weaponized someone who wishes to maintain their bodily autonomy and access the legal right to terminate a pregnancy has become. I thought about the many difficulties people who choose this option overcome just in getting to the clinic. I thought about the spectacle to have a small strange man in a cowboy hat yelling at them as they approached the doors, shaming them for the decisions they choose to make for themselves. I thought about if we accept one person’s decisions and choices in life may not be ours, but those are decisions that must be left up to each individual, what they feel and know is best for their family. So yeah, thanks for asking. I wish you’d take the time to think it over as well. Too many times one only sees what’s presented, not the whole picture. This morning, escorts were greeted by this sweet gift from some kind supporters. We are very grateful, and will happily use these hand warmers in the coming months. Donate to the Clinic Vest Project. Thanks to them, we do not need to pay for our most needed accessory. Louisville residents can sign the online petition asking their Metro Council member to support a Safety Zone. Again, many THANKS for the ongoing support! The following post is a guest contribution. If you would like to share your story or have a suggestion for a post, email everysaturdaymorning@gmail.com. Three years ago, on August 23, I had an abortion. Weeks earlier my husband and I were telling our family and close friends we were expecting. We asked those exciting questions, like, “Will the baby be a girl or a boy?” “What year would the baby graduate high school?” “Who would they grow up to be?” All of these questions would remain unanswered. Our first ultrasound revealed that the baby was measuring ten days behind what I knew it should be. A week later my worst fears were confirmed as the doctor explained that I was having what they call a “missed” or “silent” miscarriage. There was no heartbeat, but my body had yet to recognize the failed pregnancy. I had options: wait it out, take medication, or get a D & C.
Earlier this year we found out we were expecting again. I was so excited, but I also tried my best to control my fears. I didn’t know it was possible for this situation to get worse. The first 12 weeks of my pregnancy were beautiful. I was sick, tired, hormonal and all of the things you’re supposed to be when carrying a healthy baby. I went to my 12-week scan confident, but when the doctor walked in – it was yet again bad news. The baby looked very abnormal – further testing would reveal hydrops fetalis. That diagnosis at this stage meant a most certain fate: unsuitable for life. The baby’s heart would stop sometime in the coming weeks and there was nothing we could do. I had almost no time to make a decision because the state legislature was in the process of passing a restrictive abortion ban. Even though this was a wanted pregnancy with medical complications, it affected me as well. It’s when I realized that what the legislature didn’t understand is that their decisions affect everyone – and every situation. Do you know what it is like to carry a very wanted baby and be told its heart is going to stop at any given moment? Do you know what it is like to carry the guilt and emotions this brings? Do you know what it is like to carry on about your life as if nothing is wrong, to cry on your way home from work every day and wake up in the middle of the night sobbing? I know. I chose to continue the pregnancy because it was what felt right to me, but other women should not be forced to live in that agony if they don’t feel they can handle it. Looking back, I hardly know how I did. Ending a wanted or unwanted pregnancy is not an easy choice to make, but it is a right that every woman should have. Six weeks after that fateful ultrasound, my baby’s heart stopped, despite my hope for a miracle. Now I had another decision to make: deliver the baby or have a D&E. I wouldn’t judge another person for making either choice. Delivering my baby in the hospital was the worst day of my life and sometimes I wonder if it would have been easier to have been put under anesthesia and forgone the trauma. This was my third failed pregnancy – they never got any easier. Each time I left the hospital without a baby. Each time, my paperwork said the same thing: Missed Abortion. They were all planned pregnancies. I had no choice in what happened each time, but I did have a choice on the closure to them all. For that, I am thankful and committed to making sure all women have the same choices I did. This issue, with all its complexities, all its gut-wrenching decisions, all its heartbreak, is not black and white. It is our right – the right to have a choice, to have some control over ourselves and our bodies in an otherwise uncontrollable situation. UPDATE*: the Mayor vetoed the bill on Friday evening! See footnote for more details! Early in the week the South Bend Common Council voted to let an anti-abortion rights group open a new location next to the site of a proposed abortion clinic. The council voted 5-4 to grant the rezoning which would allow a fake clinic to open a new location at 3527 Lincoln Way W., next door to where Whole Woman’s Health Alliance plans to open a non-surgical abortion clinic. Kentucky’s EMW clinic shares a wall with an anti-abortion fake clinic—John Oliver recently did a segment about fake clinics, which often use deception to pose as abortion clinics, spread misinformation about abortion, offer sonograms without the oversight of appropriate medical professionals, and work to misdirect patients into entering the fake clinic. Though EMW has provided quality care for nearly four decades, patients face many challenges, compounded by the fake clinic next door. 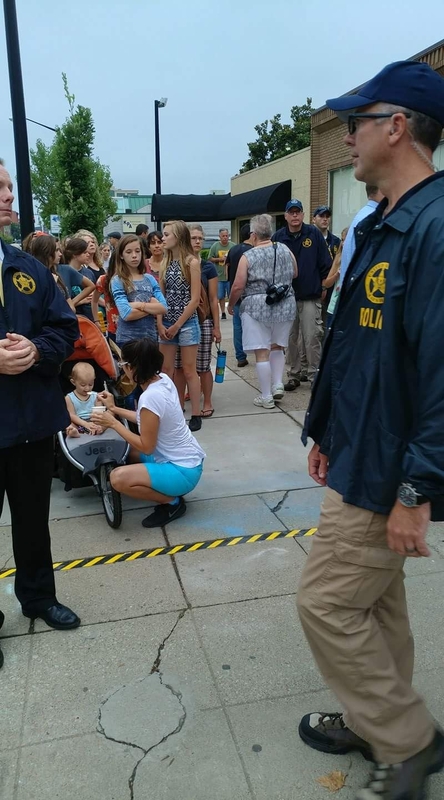 Though protesters show up every day the EMW clinic is open, on Saturdays dozens of protesters show up, necessitating multiple police officers, clogging sidewalk foot traffic, and creating an uncomfortable and unsafe environment. The fake clinic acts as a hub for some of the protesters, and their staff attempt to usher in EMW clients by posting confusing signs about free parking or waving in clients (this is particularly confusing for patients who speak English as a second language)—but there are strings attached. Fake clinics use many tactics to prevent abortion, including offering food and beverages to women so that they cannot undergo general anesthesia, or misleading patients about how far along their pregnancy is: delays to abortion can lead to higher costs or being legally prohibited from obtaining an abortion. I understand that rezoning requests must be approved if the request would be the “most desirable use” for a property, and rezoning should conserve property values in the area. In my experience, tension between an abortion clinic and a nearby fake clinic has a negative impact on the environment for surrounding businesses, regardless of their stance on abortion. The chaos on the sidewalks necessitate volunteers like me to reduce (and unfortunately we can only reduce, not stop) the harassment and confusion. Clinic escorts at EMW provide directions, offer to walk with patients and their companions, and provide tactical support—information about parking, reminders about things like bringing IDs, and directions to the entrance of the clinic. As a graduate student [redacted], I have a personal commitment to advocacy; I love being able to offer support to people from all walks of life at the clinic. But I would give it up in a second if the protesters stopped showing up and I could be confident that patients wouldn’t be misled by the fake clinic. It appears to me that you have an important opportunity to prevent some of the ugliness and chaos that we’ve seen near the EMW clinic, and I strongly encourage you to do that by vetoing Bill 05-18. To be clear, I am not asking that you pass moral judgement against fake clinics. 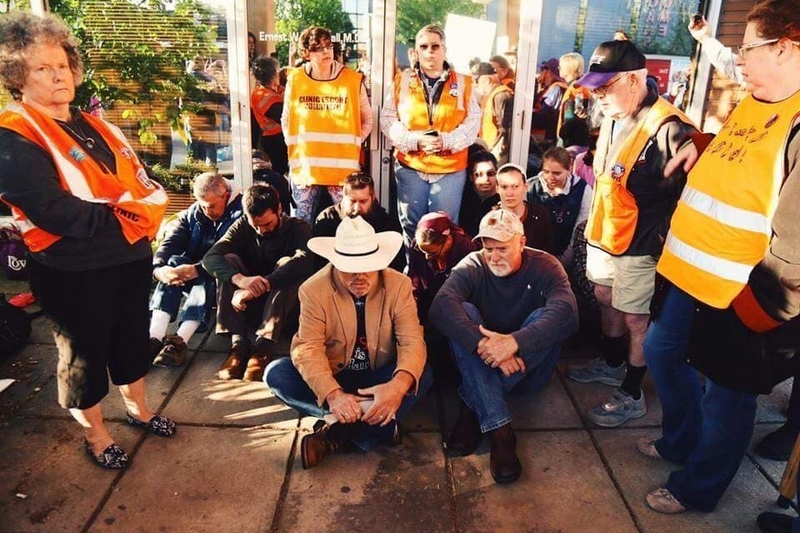 The protesters at EMW, aided by the placement of the fake clinic next door, are a hazard to public safety, and make the area undesirable, plain and simple. Police officers are frequently called, either asked to support scared or angry clients, to clear the sidewalks of protesters to make foot traffic possible (joggers will often run in the road rather than navigate the maze of protesters on the sidewalk), and even to respond to noise complaints—the loudspeakers street preachers set up in front of the clinic bother guests at hotels blocks away. I’ve even seen one hotel guest so upset she came down (at around 8am) to plead with LMPD officers to get the protesters to turn off their loudspeakers. I could go on at length about the scene at the clinic, but hope I’ve made it clear why it is imperative that you veto Bill 05-18. Please do not hesitate to reach out to me about this important issue, I am happy to answer any questions you may have. Though I’m not a constituent, I hope that I can offer a valuable perspective in this matter. P.S. Congratulations on your recent engagement! Deception on display at the fake clinic next to KY’s only abortion provider. Available for immediate release. Under a Joint Consent Order, Kentucky’s new D&E Abortion Ban (HB454) is blocked from enforcement. A preliminary injunction hearing has been scheduled for June 5, 2018. In an attempt to clarify any confusion, please note that we received a copy of the signed order from the court this afternoon, though it appears from the time stamp on the document it was filed after business hours last night. As I write this, the D&E ban sits, unsigned, on the desk of our punishing Governor. According to ACLU Reproductive Freedom Project staff, the law will automatically take effect tomorrow, Tuesday April 10th, 2018. This law will ban the safest form of abortion in the second trimester, while already having been struck down in multiple states. It is not based on scientific or medical recommendations. We are not surprised, nor are we ignorant of the motives behind this law. It is yet another step in restricting access to safe and legal care for individuals who are perfectly capable of deciding if, when, and how to create or grow their families. The impact of this law will be that people from all over Kentucky, plus surrounding states throughout the region who would have traveled for care at EMW will be forced to either travel farther (which will have additional increased costs for transportation, lodging, childcare, time off work, etc) or they will be forced to go without care, or take other – potentially harmful measures. Since Matt Bevin took office, google searches for phrases like “how to self abort” and “home abortion” have been on the rise in Kentucky. Abortions will happen despite legal restrictions. They will just become less safe. Stay tuned, as the ACLU will be taking our state government to court yet again (this will make the forth case in litigation during Bevin’s term) and also DONATE to both the ACLU and Kentucky Health Justice Network, whose Abortion Support Fund will continue supporting Kentuckians even if they have to travel as far as Illinois, Colorado, New Mexico, or Washington DC for care – act fast and your donation to KHJN will be matched by generous sponsors!! As you know, I am very passionate about Reproductive Justice, and am fully committed to abortion access in KY, particularly with additional restrictions currently coming out of Frankfort. KHJN is nearing the home stretch in our spring Dance-a-thon campaign, which benefits all of our programs, supporting access to birth control, abortion, and gender affirming care for folks facing barriers. My program, the Abortion Support Fund has seen a drastic increase in calls since the GOP took control in Frankfort and closed the Lexington EMW clinic, blocked Planned Parenthood from providing abortion care, and continually chip away at access while attempting to close the only clinic left in the Commonwealth, EMW in Louisville. We will continue to offer funding, transportation, lodging, language, and childcare assistance to our callers, even if we have to accompany them to other states. Can you help us reach our current goal of raising $30,000 by the end of this month? Please follow this link, and share this message in your networks. All donations are tax deductible and secure. If you would rather donate offline, just let me know! Every client is brought to the clinic by choices she made or was denied. I got married and had kids very young – my twins were born when I was 19 years old and 17 months later I was pregnant again. The second pregnancy gave me the resolve I needed to escape from my 32 year old husband, and I left him soon after I found out. Like many states, KY denies divorces to pregnant women, so I was to remain legally married until after the birth of my son. With two babies in tow and expecting my third, I moved in with my parents and enrolled in a welfare program that helped single mothers go to college. I aspired to provide a stable life for my children, so I asked my doctor to do a tubal ligation once my son was born. I knew I couldn’t handle a fourth child. I wanted to get educated, get a career, get off welfare, and get my own house. I was trying to be responsible. Because I was so young, the physician denied my request. Sterilization in the spring of my reproductive years, he explained, left too many opportunities for regret. I countered that my spring had been as productive as I could tolerate and I was facing three decades of managing my fertility on a pass/fail basis. Pregnancy had taken a toll on my health and I didn’t want to subject my body to another one. He said I would never find a physician to perform the procedure on a woman my age, especially a woman on Medicaid. He was right. My birth control failed ten years later and I got pregnant. A lot had changed in that decade. I had graduated from college, bought a house, and was working full time as a registered nurse. I had friends. My kids and I were living our lives with all the stability our hearts could muster. The spring of my reproductive years was certainly over—at the age of 31, summer was closing in on autumn. Despite my improved circumstances, or perhaps because of them, I hadn’t changed my mind: I didn’t want a fourth child, and I couldn’t endure another sickly pregnancy. My two best friends shielded me from the antis screaming other options at me. Abortion wasn’t my first choice of birth control. My first choice had been refused by a medical community that would rather empower me to produce a fourth child on the taxpayer’s dime, just like my divorce had been delayed by a legal community that felt entitled to make me stay married. I was too preoccupied with the challenges of daily life to notice then, but eventually I recognized the barriers that surrounded my divorce, my tubal ligation, and my abortion as institutional attempts to control the fates of pregnant women. To this day, at the age of 48 and in the winter of my reproductive life, that realization inspires me to spend one Saturday a month at EMW. Like I said, people are brought to the clinic by choices they made or were denied. 3/10 is Abortion Provider Appreciation Day!! With just one clinic in Kentucky, which is under threat of closure by the state and violent extremists, we recognize how important the work of abortion providers is. Even at this moment, Kentucky legislators continue to attack our rights and chip away at autonomy, putting families at risk. This week (and every day) we want to shout THANK YOU from the roof tops to all the doctors, nurses, administrators, counselors, and building maintenance staff that make sure #EMWStaysOpen! Abortion providers help ensure that we have the ability to choose when and whether we create families. In today’s hostile climate, they need our love as much as ever! Join us in sending some love to our local staff at EMW by writing them a virtual postcard today! We will deliver your supportive messages to EMW staff this week! Submit messages as comments on the facebook event, this blog post, or email your messages to everysaturdaymorning@gmail.com. Download shareable images from the National Network of Abortion Funds, and follow or join the tweet storm this week at #CelebrateAbortionProviders! Last week, we blogged about a resolution which was being sponsored by Louisville Metro Council members Engle, Kramer, and Parker. The resolution would give the blessing of our local Metro Government to a bill being discussed in Legislative bodies in Frankfort this session. HB103 would place medically unnecessary requirements on medical professionals and their patients. AN ACT relating to medical and nursing schools. Create a new section of KRS Chapter 164 to require all medical and nursing schools established and assisted financially by the Commonwealth of Kentucky to cease all training of any health care providers and the provision of any health care services; require all medical and nursing schools to refer citizens who are requesting advice or health care services to their state representative or state senator. Here is my response to the resolution supporting HB103, which for now has been taken off the Government Oversight Committee’s calendar. This letter was intended for each Metro Council Person to be delivered prior to the committee hearing. I write as a resident of District 6, a voter, and a passionate advocate for freedom and bodily autonomy. I write to express my deep concern for the resolution sponsored by representatives from districts 22, 11, and 18, which aimed to endorse House Bill 103, placing additional requirements on patients seeking reproductive care, and the medical staff providing them that care. In 2017, the Kentucky Legislature passed a similar law, known as the “Narrated Ultrasound Law” which required medical staff to verbally describe an ultrasound image to a patient, prior to terminating a pregnancy. This was one of several efforts by the state to restrict access to legal care while shaming individuals and families. While ultrasounds are commonly performed to determine size and location of a pregnancy, these laws place medically unnecessary punishments in the path of patients, and licensed medical professionals. Since the passage of the 2017 law, a federal district court has found that law to be unconstitutional. Despite that, our legislature seems determined to leverage their power – at the expense of taxpayers – to continue restricting access to abortion care, and bodily autonomy. In addition to appealing the ruling mentioned above, lawmakers are also attempting to pass HB103 which closely resembles that unconstitutional law. HB103 is only different in that instead of requiring the provider to verbally describe the ultrasound image to the patient (while granting permission for them to close or avert their eyes or cover their ears – which is demeaning, insulting, and patronizing at best), this equally unconstitutional bill requires the patient be given a written description of the ultrasound. To me, this requirement is eerily similar to behaviors seen on the sidewalk outside of clinics nationwide. In Louisville extremists force their opinions, literature, and physical bodies at individuals seeking care, without their consent. One way that HB103’s attempt at reproductive coercion mirrors the action of dangerous extremists is a complete disregard for whether or not the information being forced on patients is thought to be helpful, or desired by those individuals. HB103 and similar laws require providers to deliver unnecessary information to their patients, even if they verbally decline. On the sidewalk outside of EMW in Louisville, individuals are forced to endure verbal (sometimes amplified) harassment, physical threats and assault, plus gruesome inaccurate images despite clear requests to be left alone. Considering what patients go through just to get to the clinic, the idea of legislative bodies forcing medical staff to perform unnecessary and undesired actions on their patients is deeply troubling. In 1973 the US Supreme Court clearly ruled that decisions about one’s reproductive care are to be made by a patient with support from their care providers. Since then, states have erected restrictions designed to make access as challenging as possible. I find this unacceptable, and for Metro Council to be hesitant to put public safety measures in place outside our Commonwealth’s only clinic, while simultaneously endorsing additional restrictions on access is beyond disappointing. Attached please find the results of a recent study by the National Institute for Reproductive Health (NIRH), which examined and scored 40 cities based on 37 indicators in the areas of reproductive health, rights, and justice. Our “Compassionate City” scored 1.5 out of 5 stars, not just due to barriers to abortion access, but also for lacking in areas such as protections for pregnant people, and working parents. I believe Metro Government could do a lot to improve our score in this well researched study. I know that passing a resolution in support of further punishing people seeking reproductive care is not moving in the right direction. When NIRH released their findings last Fall, they kindly created a Model City blueprint to highlight the ways in which truly compassionate cities can step up and take care of their citizens. Please take a look at the Model City profile and think critically about what kind of city we are creating for current and future residents, and how we might improve the expereinces of those individuals and families who call Louisville home.